Winning Women is Virtual Enterprises’ first-ever Female Leadership Conference Series designed to support and prepare high-potential VE female students for future success. 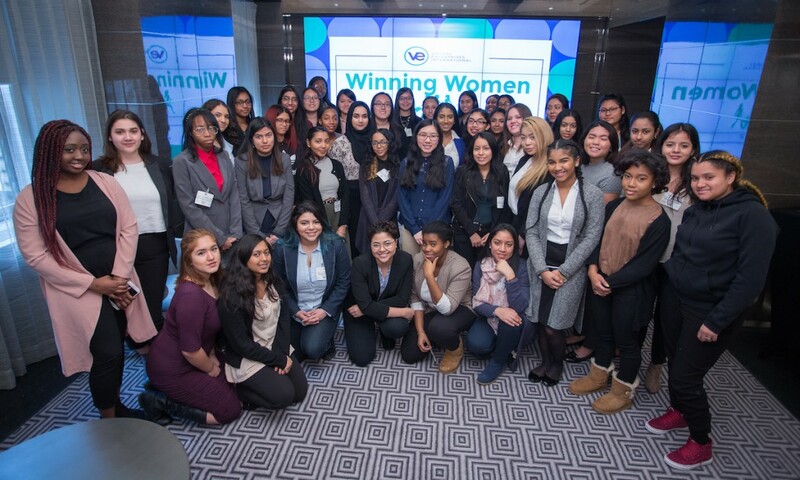 This conference which took place on March 3 was the second in a series hosted by NBCUniversal, and provided 50 female VE students with leadership and early career development training. The morning session, led by executive coach Karen Lindsey of Lindsey Resources, focused on four key themes: communication skills, personal brand, professional presence and emotional intelligence. During the afternoon, female business leaders from a variety of industries engaged with the students in themed break-out activities intended to put the morning coaching session into action. The wisdom and expertise of these real world “Winning Women” truly inspired and empowered our young adults. A special thank you goes to Alexandra Van Arkel, Founder of Winning Women, and her team of mentors at NBCUniversal who spearheaded this important initiative for Virtual Enterprises. Kijana Anderson, Human Resources Specialist, Acad. for Scholarship & Entrepreneurship HS, Tech & Style Inc.
Imani Barnes, Chief Financial Officer, Acad. for Scholarship & Entrepreneurship HS, Wavy Jewelry & Accessories Inc.
Sheneya Edwards, Chief Financial Officer, Acad. for Scholarship & Entrepreneurship HS, Tech & Style Inc.
Skylar Saunders, VP of Graphics, Acad. for Scholarship & Entrepreneurship HS, Wavy Jewelry and Accessories Inc.
Michelle Flores, Chief Operating Officer, Fort Hamilton HS, Avant-garde Furnishings, Inc.
Bianna Kuris, VP of Marketing, Fort Hamilton HS, Avant-garde Furnishings, Inc.
Vicky Yu, Asst. VP of Sales, Fort Hamilton HS, Avant-garde Furnishings, Inc.
Ashley Sepulveda, Asst. VP of Administration, IN-Tech Academy, Fusion T.L.C. Lauren Soriano, Chief Operating Officer, IN-Tech Academy, Fusion T.L.C. Stephanie brings to bear the insights that come from more than 30 years’ experience in financial services and the discipline to stay abreast of market cycles, changes, and trends. Stephanie’s deepest satisfaction comes from helping clients manage not just their financial futures, but also live the lives they’ve always wanted. Stephanie is an active member of the Financial Women’s Association (FWA) of NY and has co-chaired the Daughters 2000 Committee focused on developing financial literacy for girls ages 8 to 18. Ritu Banga is co-founder of Zoomdojo, a college-to-career initiative. Ritu started her career in product management, marketing and sales. She was an early entrepreneur with Point of View, her strategic consulting firm, which worked with global companies and NGOs entering India as it opened its economy in the early 90’s. Ritu is a graduate of Delhi University and the Indian Institute of Management, Ahmedabad. She is currently a trustee of Marymount School in New York, serves on the advisory board of SAYA (South Asian Youth Action) and is an advisor to the South Asia Business Assn. at Columbia University. Susan Berkenbush is an energetic and dedicated vendor management professional and educator. Susan and her team ensure that KPMG’s technology requirements are consistently met with high-quality, high-value products and services. She is also an adjunct instructor of graduate business programs at Saint Peter’s University. Her strengths include coaching for optimal performance, driving organizational change, building diverse, highly-motivated, effective teams, and providing exceptional customer service. Adrienne’s background includes 25 years of experience helping companies in the financial, technology, consumer goods, staffing and wellness industries successfully expand in product offerings and grow in revenue. She has held strategic roles in marketing, sales, management and compliance. At the investment management firm Gerstein Fisher, Adrienne is responsible for the development and implementation of the firm’s integrated marketing strategies. Allison Dombrow has been with NBCUniversal for more than 15 years. She currently supports Content Distribution and TV & New Media Distribution. Prior to this role, Allison served as Director of Human Resources for NBC Worldwide News Gathering, where she supported the domestic and international news bureaus as well as News Channel in Charlotte, NC. She has also worked with the Television Production Group supporting show such as The Tonight Show, Access Hollywood, The Office, Parks and Recreation, and Parenthood. With career sales close to $3 billion, Louise Phillips Forbes is an industry leader in the New York City real estate market. One of Manhattan’s elite Power Brokers, she is a multi-time winner of Halstead Property’s esteemed Broker of the Year award and currently leads the firm’s #1 team. Louise is a guest lecturer for the Real Estate Board of New York (REBNY) and has been a panelist for the Asian American Real Estate Association’s East Meets West Luxury Real Estate conference and the annual Inman News Conference in New York, as well as a consistent contributor to Halstead Property’s Empowerment Programs. An enthusiastic supporter of the arts, Louise is an active board member for Change for Kids, a non-profit that provides cultural arts programs for inner-city school children. She is also a wife and busy mother-of-two sons. Ms. Germano is an insurance executive with 20 years’ experience in the management of US umbrella liability and global casualty insurance portfolios. Areas of expertise include profit and loss management, traditional and e-business marketing, new product development, underwriting management, client retention, guideline control, change management, and staff development, recognition and retention. Ms. Hanson joined Goldman Sachs in 1977 where she remained for 14 years. She then founded Milestone Capital, a money market fund company managing over $2 billion in assets. In 2002, Ms. Hanson became a Managing Director and Senior Advisor to the President & COO of Lehman Brothers. Hanson is a member of the Forbes Executive Women’s Board and the Kellogg Center for Executive Women’s Steering Committee. She is a former member of the Board of Trustees of Wheaton College (MA) and a board member of the Christopher and Dana Reeve Foundation. She is an Associate Fellow of Pierson College at Yale University and serves on the Advisory Board of the Center for Talent Innovation. She has received a number of awards, including an honorary degree from Middlebury College in 2007. Ms. Hanson is a graduate of Wheaton College and Columbia Business School. Loanne began her career in finance at NBC Universal and transitioned into HR where she is currently the Director of Human Resources. She is responsible for driving strategic planning, organizational design & integration, staffing, compensation planning, manager coaching, employee development, and compliance and performance management across Ad Sales client groups. Loanne attended Penn State for her undergraduate degree and NYU for her Master’s degree in Human Capital Management. Margaret Marcucci is responsible for leading the development of CorAnet’s financial strength, marketing strategies, and employee development. Under Margaret Marcucci’s leadership since 2004, CorAnet has tripled revenue, improved EBIT, and added Fortune 100 clients and government contracts, thereby expanding its geographic footprint to a national level. For the first time in 2016, Inc. Magazine included CorAnet in its ranking of the fastest growing companies in America. Margaret is the recipient of the Women Presidents’ Educational Organization Star award and is one of the WBENC’s 2016 Women’s Business Enterprise stars. Margaret is also a member of the Enterprising Women of the Year of 2016. Christine heads a team which is responsible for licensing all of NBCUniversal’s premium film and television content to Cable, SVOD and Pay TV providers. Christine began her career in Accounting at PWC and has since worked for NBC in a variety of positions for 15+ years. She received her undergraduate degree from Binghamton University and her MBA from NYU. Erin manages the subscriber forecasting, analysis and reporting for NBCUniversal’s portfolio of national cable networks as well as its Regional Sports Networks, generating over $6 Billion in revenue a year. Prior to joining Content Distribution, Erin completed Comcast NBCUniversal’s CORE Program where she rotated across various Finance teams in Philadelphia and New York. Erin is a graduate of Villanova University. Tara is the STEM & Technology Education Program Manager for NPower, a technology nonprofit. Tara oversees NPower’s K-12 programs that reach over 8,000 youth annually and works with youth-serving nonprofits and partners to create meaningful, skills-based learning programs. Tara has over seven years’ experience in STEM education and youth development, focused on building pathways for girls and underserved youth to enter higher education and STEM fields. Tara and graduated from Mount Holyoke College. Surabhi Pokhriyal is an Associate Consulting Director at Cognizant, a $13B and Fortune 500 technology and innovation company. Surabhi comes with over 12 years of business consulting experience in the Retail and Consumer Goods sector, specifically in areas like mergers and acquisitions, digital transformation and supply chain management. She is also an active member of women in technology initiatives and provides mentorship and guidance to graduates. Meaghan has worked at Comcast/NBCUniversal for the past 4.5 years in various finance roles and is currently a Digital Ad Sales Finance Manager for NBC’s Digital News properties. Meaghan is a 2012 graduate of the University of Virginia. Ingrid Rinck, a personal trainer with over two decades of expertise in the health and fitness industry, is the “go to” person for women’s weight loss at her two packed fitness facilities on the Northshore. In 2014, Ingrid launched a healthy meal service called Sensible Portions Meals. In the past three years, Ingrid has taken common-sense eating habits and turned them into a multi-million dollar business. Once a single, struggling mother of three, this native of New Orleans has ascended the ranks to become a mogul in the world of healthy eating and nutrition. With tenacity, innate business sense and a desire to help others, she has gone from rags to riches and is the embodiment of the American dream. Cherie Serota, an Adjunct Professor in Fashion Merchandising, has been a part of the fashion industry for over 25 years. As the co-founder and president of Belly Basics, Inc., she revolutionized the maternity market in 1994 with the introduction of The Pregnancy Survival Kit, which gained worldwide recognition and changed the way pregnant women dressed across the globe. As a fashion expert, Serota has been featured in national magazines and newspapers, and continues to contribute to leading industry publications. She was elected to the Long Island University Board of Trustees in October 2014. Alexandra is Senior Manager of Strategy for NBCUniversal’s Content Distribution group. Previously, Alexandra was a Finance Manager for NBC’s Owned Television Station group. She started her career in investment banking at Barclays. In 2014, Alexandra joined Virtual Enterprises as a business mentor and a member of the New York City Advisory Board. For the past three years, she has trained and advised students from the Jacqueline Kennedy Onassis High School in business and management fundamentals and supported them throughout the college admissions process. In 2016, with the help of her colleagues, Alexandra founded the Winning Women Conference Series for high potential female students enrolled in Virtual Enterprises. Alexandra graduated with a B.A. in History from Yale University. Tara is the Senior Finance Director for the Cable Entertainment Group at NBCUniversal. She oversees programming and operational finance for the group’s portfolio of Cable properties, including USA, SyFy, E! and Bravo. She is also the outgoing President of the NBCUniversal Tri-State Women’s Network. Tara is a graduate of Northeastern University. Jennifer Walsh is a veteran in the retail space. She has been a true pioneer in the beauty business. Ms. Walsh founded the very first omni channel beauty brand in the US with her creation of the Beauty Bar in 1998. Her role has involved everything from being a celebrity make-up artist to being a freelance beauty writer, a book contributor, producer of photo-shoots, a guest speaker, a veteran TV beauty expert, the founder and creator of what became a chain of beauty boutiques, and the CEO of her own beauty company. Her experience has made her a well-respected beauty and skin care expert. Debra Weiser is a leader in the insurance industry, serving in roles including President of Travelers Excess Casualty, a business unit offering mono-line umbrella and excess liability insurance through retailers and wholesalers. One of Debra’s passions is developing female leaders. She has served as a mentor for “W.O.M.E.N. In America” since 2012. She was also named to Reactions magazine’s “Top 50 women in the insurance industry” in 2013. She is also a member of the Board of Directors for Virtual Enterprises International.